VO2 max is a measure of cardiovascular fitness level. Also called aerobic capacity, VO2 max quantifies the maximum volume of oxygen (O2) that your body can consume at peak exercise capacity. It is measured in milliliters of oxygen per minute per kilogram of your bodyweight (ml/min/kg). Those with higher VO2 max can exercise more intensely than those who are not as well conditioned. Why should I measure my VO2 max? 1. Figure out how hard you should train. The VO2 Max test provides several different pieces of information, including your max heart rate and training heart rate zones. Knowing your individual training heart rate zones ensures that you're training at the correct intensity to meet your specific goals, whether it’s burning fat, increasing aerobic capacity, or improving active recovery. 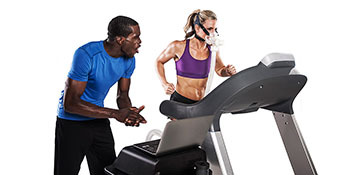 Additionally, the VO2 Max test identifies your Aerobic Threshold (AeT) and Anaerobic Threshold (AT). These markers report the energy system your body is using at specific exercise intensities. Training in your Aerobic Threshold? Get comfortable - this should be sustained exercise focusing on endurance and fat burn. Have a little more to give? Once you cross into your Anaerobic Threshold, you’re now exercising “without oxygen.” Be prepared to work hard, work fast, and train in a max effort zone that will quickly deplete muscle energy stores. Improve these thresholds over time, and you will markedly improve your overall fitness performance and capacity. 2. Measure and track progress in the development of your aerobic capabilities. Being able to quantify your aerobic fitness level is particularly useful for improving performance at running, cycling, rowing, or any other kind of sustained aerobic exercise. It can be useful to get a VO2 test once at the beginning of your training, and then again right before a race or competition, to see what kind of improvements your body made in that time period. 3. Benchmark yourself against other people. Wondering how your fitness stacks up against elite athletes? Below, we’ve given some known VO2 values for different sports, and for some elite athletes, in case you’re curious! The test will take approximately 10 – 20 minutes. If you have any conditions that may affect your ability to run at max effort (such as illnesses, injuries, or respiratory conditions), it is best to wait until those conditions go away. You will be given a mask to wear over your mouth and nose that will measure your oxygen and carbon dioxide levels as the test progresses. You’ll also be wearing a chest strap heart rate monitor. You’ll start by walking on the treadmill to warm up. The test administrator will carefully increase the intensity of the test protocol using levers of speed and/or incline until you have reached your max effort, at which point the test is terminated. We’ll be monitoring you and cheering you on! VO2 tests are $100 each, or you can purchase a package of 2 test for $180. You can split the package with a friend, or save both tests for yourself.